To place an order, email: bfs217@gmail.com. Deviation was written with upper level middle school and junior high bands in mind, but also works well for high school concert band. 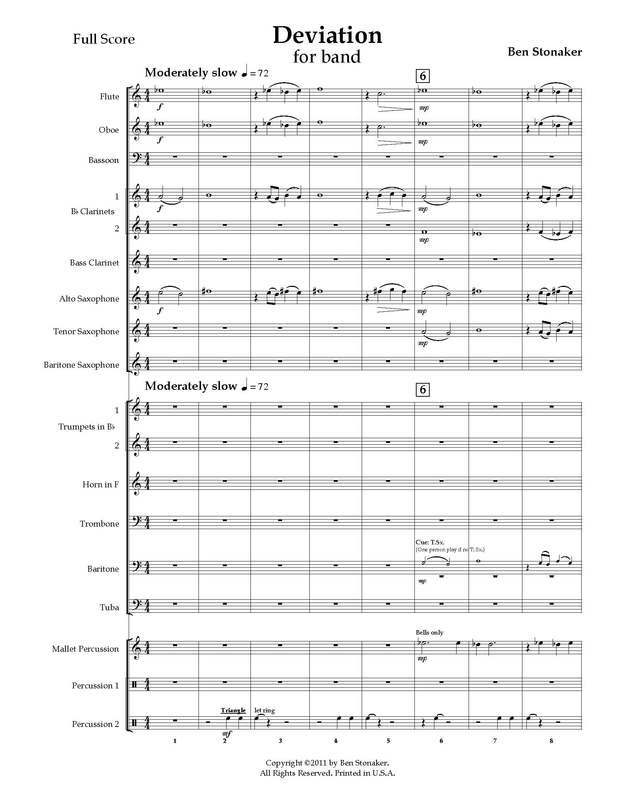 The piece focuses on several small, repetitive motives before the band comes together to play one of the motives in rhythmic unison at the climax – a driving, Bartók-like moment in the octatonic scale. The slow opening acts as an introduction to the layering of several ideas in the fast section. These ideas are organized by short phrase lengths, overlapped in different ways to create an asymmetrical transition to the climax of the work. Take note that the motives starting at 19 are arranged where the clarinets are in five-measure cycles, the flute/oboe/mallets are in two (or four) measure cycles, and the low voices in three-measure cycles. Finally, at 47, the repetitiveness deviates from its course and introduces a melody in the octatonic scale. At the end of the work, there is a moment of calm just before one, final iteration of the repetitive material, as if starting a new section, ending with a single hit on the tambourine.